I read with a pen in my hand. Mark up the pages, underline passages, use check marks and asterisks, write in the margins. It’s one of the things that makes me uneasy with library books, because I lose that activity, that physical engagement with the text. One of the things I’ve learned about book reviews, and conversations about books, is that we all read differently. I’m a slow, attentive reader, conscious always of the writer. I love sentences more than plot, closely observed details over dramatic twists and turns. When I encounter readers, especially on the blogs, who somehow seem to ingest books, one after the other after the other, I’m amazed by the pure quantity of reading. I am also, I must admit, a little distrustful. When a reader goes from book to book to book in rapid-fire fashion, isn’t that similar to watching a movie, then another movie, then another movie? How do they keep it in their heads? Doesn’t yesterday’s movie get pushed out too soon? Where’s the reflection? The after-pause? 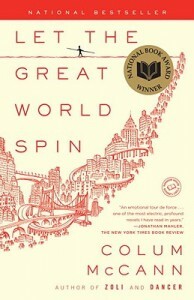 To me, the best part of reading — the part that sticks — is all the stuff that happens when you are not actually reading. I love those books (and films) that come back to me days later, lingering in the mind. We’ve all said it, “I was thinking about that movie we saw last week.” The best ones adhere to you, but my sense is that you’ve got to leave room for that to happen. How can that essential critical experience be possible when there’s always the next thing pressing to the front of our consciousness? Anyway, that’s preamble. I’ve recently been getting a similar question from readers: “Can you give me any writing tips?” Oy. I’ve never been real comfortable with that, though I do have my ideas and convictions. I guess I don’t like the mountaintop perch. Everyone has to find his or her own way. 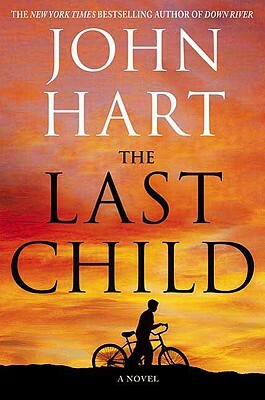 But in an effort to respond seriously, to point to one thing about writing, I decided to scan a few pages from three recent books I’ve read and enjoyed. Because the reading feeds the writing. And if a book isn’t useful to me in that way, I’m generally not all that interested in reading the book. A writer has got to eat. 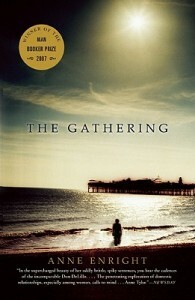 The first scan is from The Gathering by Anne Enright. It won the 2007 Man Booker Prize. Told in the first person, it offers a wounded woman’s singular perspective. And on every page, Enright crafts sentences that blow me away. She can flat out write. 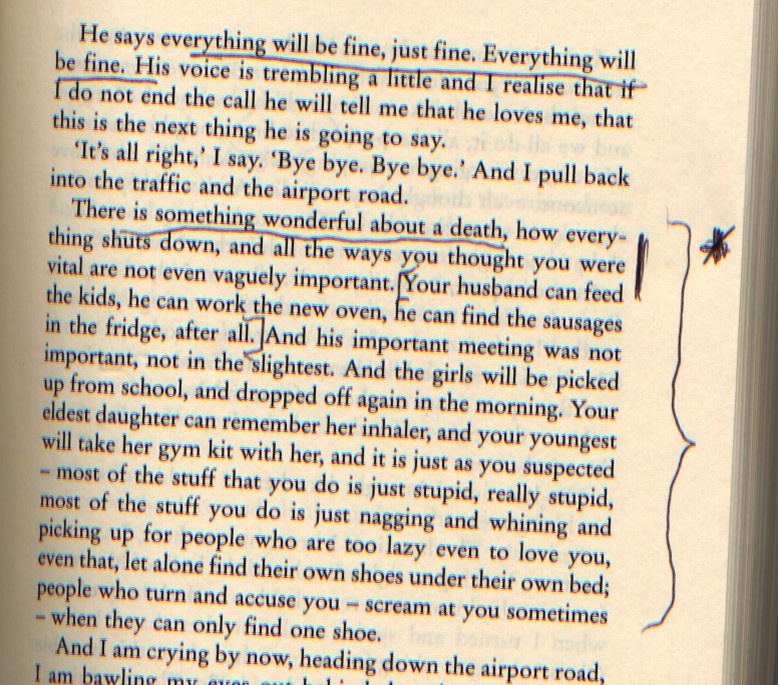 This is probably more representative of what a page from a good book that I’ve read looks like. 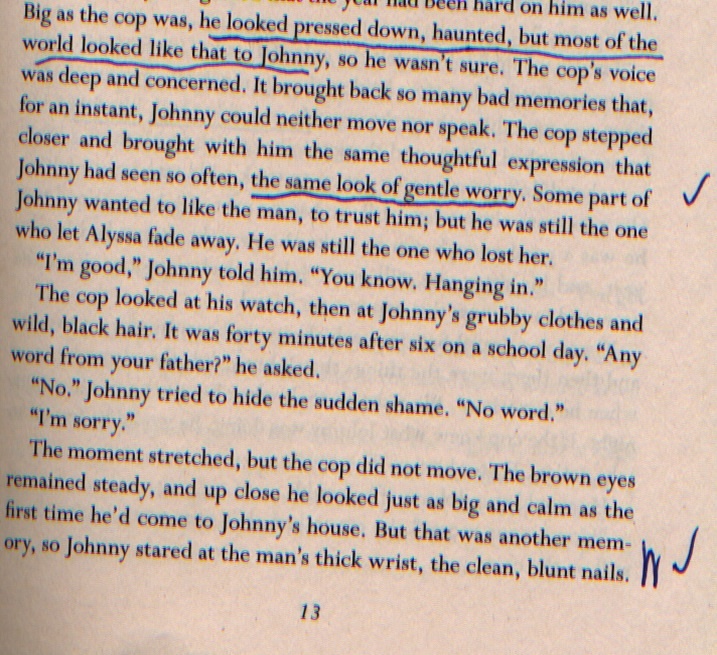 Again, I admired the subtlety of the final two lines, how the boy pushed memory aside by concentrating on specific details, “the man’s thick wrist, the clean, blunt nails.” It reminds me that every scene has its particulars, that as a writer imagining a scene I have to pay close attention. Just a great piece of description expressed with a point of view. A man is about to walk into a hospital. I can see it. The comparison to the ash of a cigarette is brilliant, and that final sentence is funny, fresh. A hospital in need of a hospital. Definitely deserving of a check mark.